Hashimoto's thyroiditis : In this autoimmune disorder, the body attacks thyroid tissue. The tissue eventually dies and stops producing hormones. : This drug has also been implicated as a cause of hypothyroidism. A hypothyroid infant is unusually inactive and quiet, has a poor appetite, and sleeps for excessively long periods of time. Cancer of the thyroid gland is quite rare and occurs in about 5% of thyroid nodules. You might have one or more thyroid nodules for several years before they are determined to be cancerous. People who have received radiation treatment to the head and neck earlier in life, possibly as a remedy for acne, tend to have a higher-than-normal risk of developing thyroid cancer. WebMD Drug Reference from MedicineNet: "Llevothyroxine Oral." 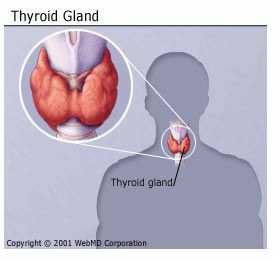 Am I at Risk for Getting Thyroid Cancer?